A junction between positively- (p-Si) and negatively-doped (n-Si) silicon that forms during the rapid melting of an upper iron silicide coating could significantly speed up solar cell production. Credit: G. K. Dalapati et al. By rapidly heating silicon wafers covered with thin iron silicide and aluminum films, A*STAR researchers have developed a way to eliminate many of the complicated, time-consuming steps needed to fabricate light harvesting solar cells1. Silicon photovoltaic devices typically sandwich two semiconductor layers containing positively or negatively charged impurity atoms, or dopants, into a so-called p-n junction. The electric field that forms at the p-n interface is an efficient way to collect charge carriers generated from incident light. However, accurately implanting or diffusing dopants into silicon requires specialized equipment and ultra-clean manufacturing conditions. Goutam Dalapati and co-workers from the A*STAR Institute of Materials Research and Engineering found that metal silicides, substances produced when metal coatings are annealed with silicon wafers, hold new promise for reducing solar cell production costs. Metal silicides are fundamental to the operation of nearly all microelectronic devices, and behave like conductive wires or voltage-dependent switches depending on their contents and preparation conditions—an adaptable nature the team aimed to exploit with iron-based silicides. "We studied iron silicides because they have metallic states as well as semiconducting states," says Dalapati. "We found the metallic states of iron silicide can re-grow the silicon substrate they were deposited on—something that has not been investigated before for solar cell applications." The team used simple sputter deposition to lay down nanometer-thin coatings of aluminum and iron silicide precursors onto an n-type silicon wafer. After a rapid thermal anneal that transforms the coatings into a metallic aluminum alloyed iron silicide state in just one minute, they examined the resulting interfaces with transmission electron microscopy (see image). 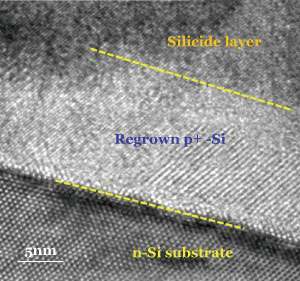 Sandwiched between the aluminum alloyed iron silicide coating and the n-type silicon was a 5–10 nanometer wide strip of regrown silicon crystals with high densities of aluminum p-type dopants—a spontaneously formed p-n junction. Solar illumination experiments revealed the team's interface engineering had a strong effect on photovoltaic performance: the light harvesting efficiency improved from 0.8 to 5.1 per cent after the rapid thermal anneal. Dalapati explains that the metallic state of iron silicides acts as a dopant reservoir, supplying silicon atoms to re-grow into uniform, aluminum-doped layers in a few short steps. He also notes that optimization of parameters such as aluminum concentrations might enable further control over this regions' thickness. "This approach makes a p-n junction that is very stable, reproducible, and possible to make in large areas" says Dalapati. "With proper anti reflection coatings, we might get to record efficiencies for silicon cells."